Cycling is the single largest mode of transport counted on the City streets during the morning rush hour, according to a recent traffic survey by the City of London Corporation. [i] Those looking for a healthy commute, preferring to take to two wheels around the City, should consider New Union Wharf by L&Q, E14. The development is ideally placed for Londoners seeking a home nearby several popular cycling routes, including the 8km cycle superhighway recently given the greenlight, stretching from Hackney to the Isle of Dogs via Canary Wharf, Mile End and Victoria Park. Whether it’s commuting to work or for leisure, residents at New Union Wharf can replace public transport with pleasurable bikes rides in this riverside location. Comprising a collection of one, two and three-bedroom apartments, New Union Wharf is situated in the heart of the Isle of Dogs and boasts a unique dockside location which mixes urban cool with quayside calm. The car-free development has been thoughtfully designed to ensure it is bicycle friendly, offering secure bike storage for residents. Such a distinctive position on the waterfront caters well for those who prefer more active modes of transport, such as cycling and walking. With the River Thames just steps away from residents’ front doors, New Union Wharf has unique access to the Thames Path, a five-mile pathway stretching from the Isle of Dogs, all the way to Tower Bridge. Homebuyers will also have access to London’s excellently connected cycle superhighways. These include a route from Canary Route to Stratford High Street, a route from the London Docklands to Greenwich, and finally a dedicated cycle highway from Victoria Park to Tower Hill. For residents that do not have their own bike, there are several Santander docking stations only a short walk from the development, including in St John’s Park and on Jubilee Crescent. 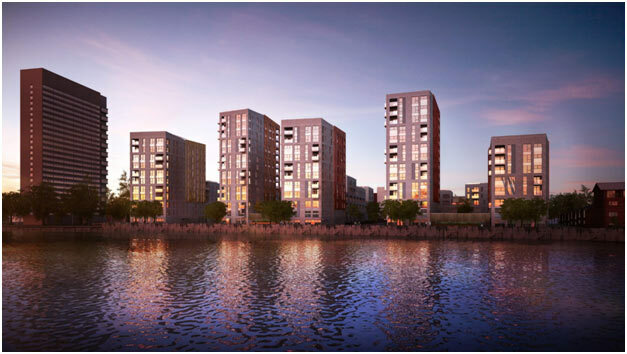 Gavin Stewart, Director of Sales and Customer Services for L&Q’s East Region, comments: “With the Thames Path on residents’ front doorstep, those living at New Union Wharf are well-placed to reap the health benefits associated with spending more time in the great outdoors. The path offers a scenic route for keen cyclists or walkers alike, and for those who like to hop on their bike for the commute into work residents at New Union Wharf can enjoy easy access to London’s cycle superhighways. Apartments at New Union Wharf have been considerately designed with the modern-day purchaser in mind. From floor to ceiling windows that flood each apartment with an abundance of natural light, to generous storage space allowing residents to neatly store away their belongings, New Union Wharf ticks all the boxes. Each home offers spacious private outdoor space, whether in the form of a balcony, winter garden or terrace. Situated within Zone 2, and with three stations nearby to choose from, when it comes to other methods of transport residents are equally spoilt for choice. Canary Wharf is a 30-minute walk from the development and under 10 minutes via bicycle, while Crossharbour Station and South Quay on the DLR line are both an eight-minute walk away, with the latter connecting to Bank station in only 16 minutes and Liverpool Street in under 25 minutes. Commuters travelling to Europe and beyond for work and leisure are also well placed, with London City Airport, less than four miles away from the development. Prices start from £414,750 for a one-bedroom apartment and Help to Buy is available on a selection of properties. For more information, please visit www.newunionwharf.co.uk or call 0333 234 1167.